← Live Your Life Like a Butterfly! There are many ways to brighten our lives with butterflies. 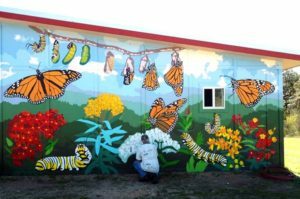 Some communities have beautiful butterfly murals that do just that. 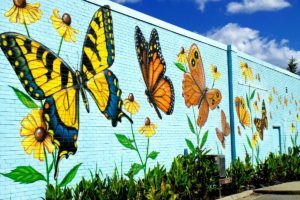 This lovely mural is located in South Norfolk, Virginia, (all murals in this article are located in the USA) and was painted by artist Chip Wilkinson. 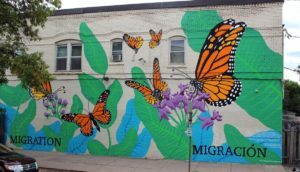 You can find these Monarch butterflies on the side of Toni’s Market in the Phillips neighborhood of southside Minneapolis. 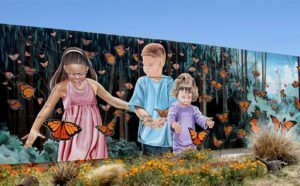 “Monarch Magic” depicts the Monarch butterflies that overwinter in a strand of eucalyptus trees on South Vandenberg Air Force Base. You can see it on a stroll through Old Town Lompoc, California. This beautiful mural is located at Candlelight Ranch near Austin, Texas. Candlelight Ranch provides therapeutic and educational nature-based experiences to enrich the lives of at-risk youth and children with disabilities. Sometimes murals have a story. “The Butterfly Effect: Dreams Take Flight,” depicts life in Joplin, Missouri both before and after the devastating tornados of 2011. It was inspired by the stories of young survivors who said that they saw butterfly people who protected them from the storm. 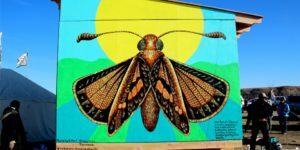 A mural can also be political such as this one, which is intended as a show of support of the Standing Rock Sioux Tribe’s campaign to protect their water and sacred grounds from the Dakota Access Pipeline. In addition to the threat to people, water and sacred places, the Dakota Access Pipeline could also kill the Dakota Skipper (Hesperia dacotae) a rare prairie butterfly protected under the Endangered Species Act. 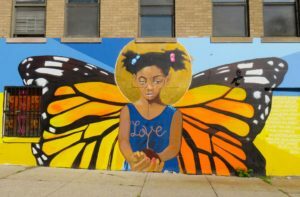 Some murals carry a message of love and hope such as this beautiful artwork in Newark, New Jersey. 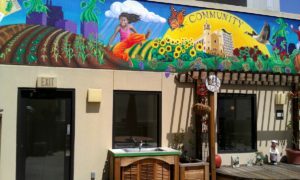 The Monarch butterfly in this mural, located at the Cecil Williams Glide Community House in San Francisco is a symbol of hope for homeless families and individuals, and people recovering from addiction, where they receive support services.